You have options to properly clean your retainer... Ew, we don't want your denture, mouthguard, nightguard or retainer to look like that photo. Denture cleaner: These are not just for dentures! 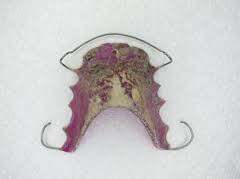 Efferdent or Polident are great options to clean your retainer with. Following the recommended time on the cleaner's instructions, soak your retainer, rinse with water, and clean the surface gently with a soft toothbrush. Mouthwash: Using a non-alchoholic mouthwash, soak your retainer for an hour and then gently clean the surface with a soft toothbrush. This will give your retainer a fresh taste and smell! Remove your denture(s) every night to allow your oral tissue to breathe. Place denture(s) in a cleaner such as Polident or Efferdent or simply water overnight in either a cup or ultrasonic cleaner. Brush denture(s) daily with a soft toothbrush and mouthwash. Toothpaste is too abrasive and may scratch your appliance. Dentures, like teeth, must be brushed daily to remove food and plaque. Brushing will also help prevent stain. Wear your mouthguard every night to prevent damage or strain on teeth and jaw muscles. Before insterting mouthguard, rinse it with warmer water for 30 seconds so the mouthguard fits easier on teeth. Remove in morning and brush with a soft toothbrush and mouthwash. Let your mouthguard dry in a cool area. Also Read : Baby and Kids Toothpaste: When should you switch? There are also ultrasonic cleaners available on sites such as Amazon, that work wonders to keep them clean. *Don't forget to bring all your appliances to every 6 month recall at Life Smiles family dentistry in Plymouth, MN so that we may clean them for you.